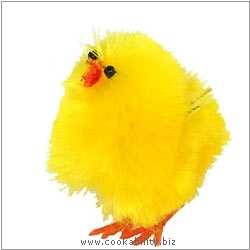 Easter Chicks that are suitable as cake decorations. Minute pipe cleaner style wings and beaks, little black beads for eyes, and orange plastic feet. Smiles guaranteed. These little chicks stand approx 40mm tall. Not suitable as toys and certainly not edible.